I plant Dianella tasmanica for the unusual blue seed pods more than for any other reason. Dianella tasmanica is hardy, the Flax Lily can handle drought conditions the Flax Lily spreads at a reasonable rate by runners and blue flowered stalks grow to 18"in height. Dianella tasmanica is hardy to 15 degrees or lower. The fruit is not edible and can cause digestive discomfort. Dianella tasmanica will survive even when the garden gets no care. In a few gardens that I have restored I have found Dianella tasmanica still growing enthusiastically amongst the weeds. 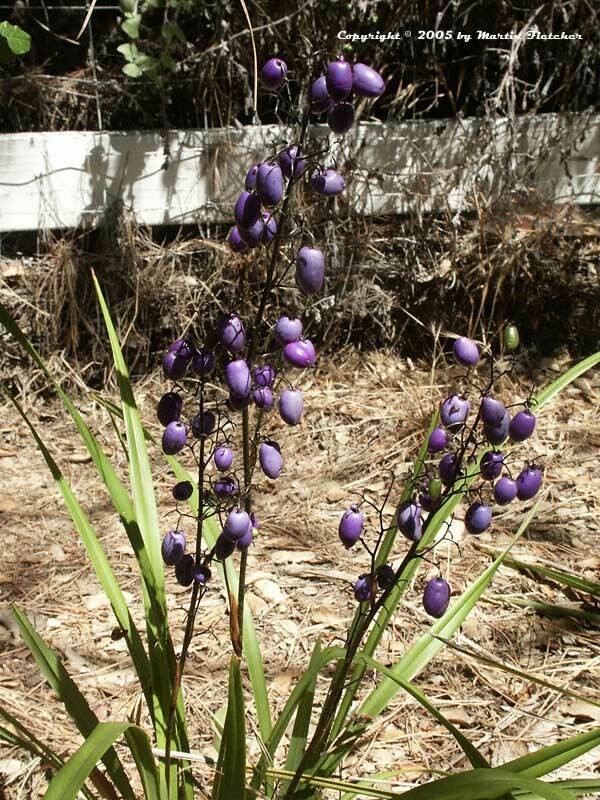 But mostly the reason to have this Dianella tasmanica is those metallic looking purple-blue seed pods. The fruit do look like something that came from another planet. Metalic blue fruit and green foliage of Dianella tasmanica - Flax Lily. High resolution photos are part of our garden image collection.